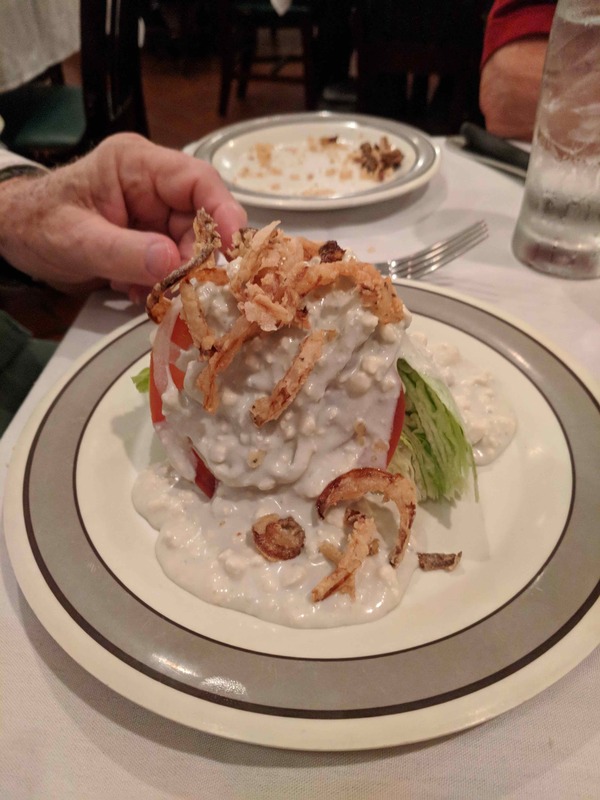 I had wanted to try another New Orleans steakhouse for my birthday and finally found the time to visit Crescent City Ste ak House almost two months after my actual birthday with two good friends, Charlotte and Thomas. Talk about stepping back in time. From the subway tile on the floor to drinks that were almost entirely too strong, this place is a hold over from an earlier era. 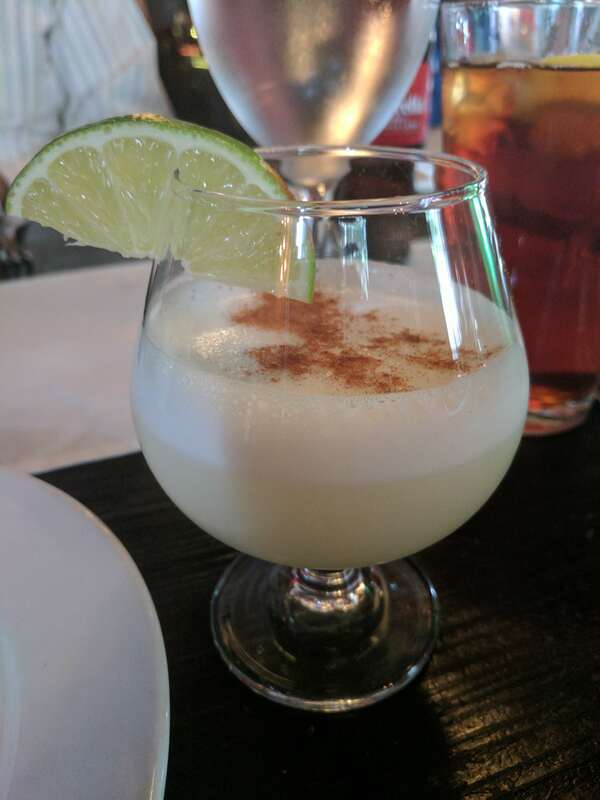 Luckily the bartender was fine with adding more ginger ale to my pisco based cocktail. They even have a few private, curtained booths for romance or confidential discussions (the Orleans Parish Criminal District Court is just down the street). 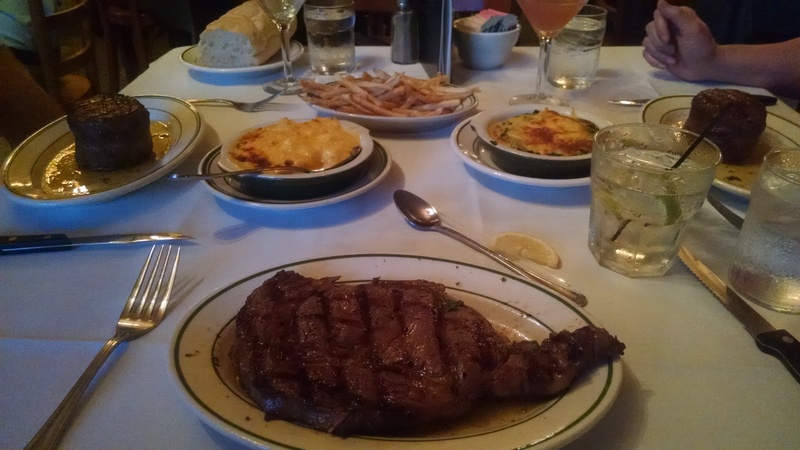 We, of course, all ordered steaks. 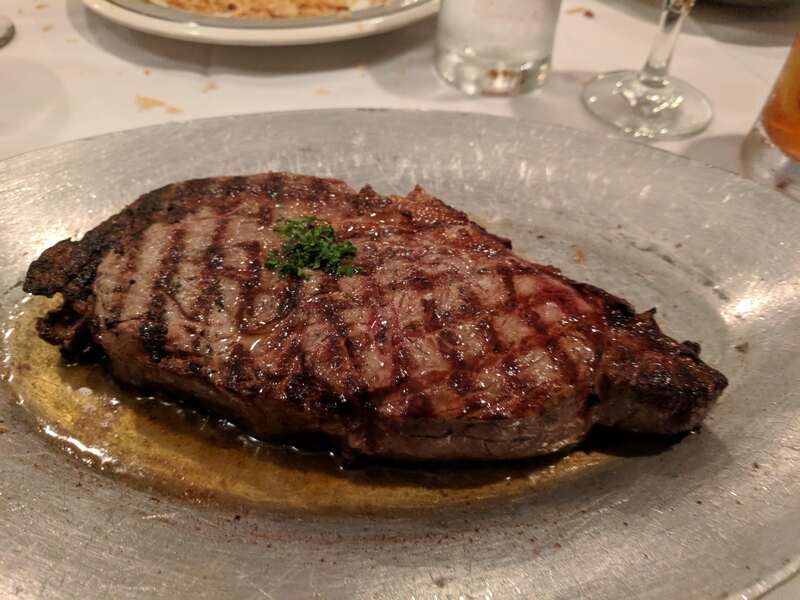 I had the ribeye that was a bit more gristly than I expected for the $28 price tag but it came out sizzling with butter and was very lightly seasoned so the taste of the dry aged meat shown through. Both Thomas and Charlotte had the filet and thought it cooked to perfection. The sides come a la carte and we ordered potatoes au gratin and shoestring and they had the spinach au gratin. 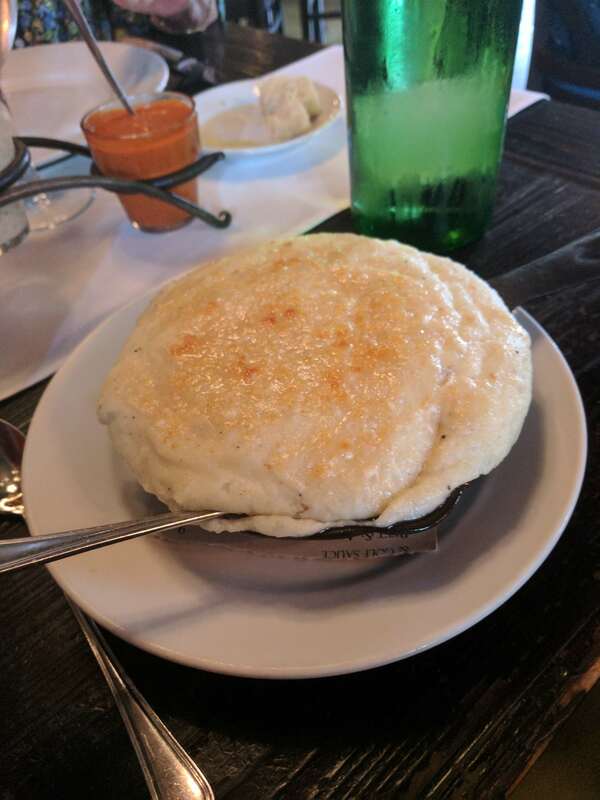 Lots of gooey, cheesey, starchy goodness. 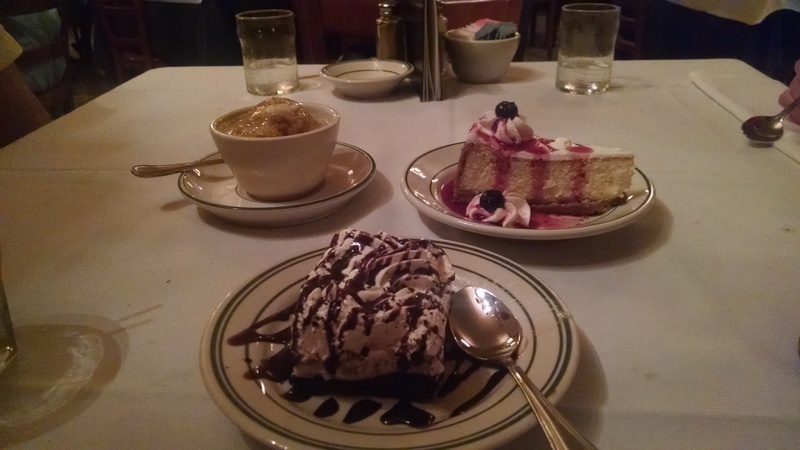 For desserts, we tried them all – bread pudding, creole cream cheese cheesecake and the Z pie. 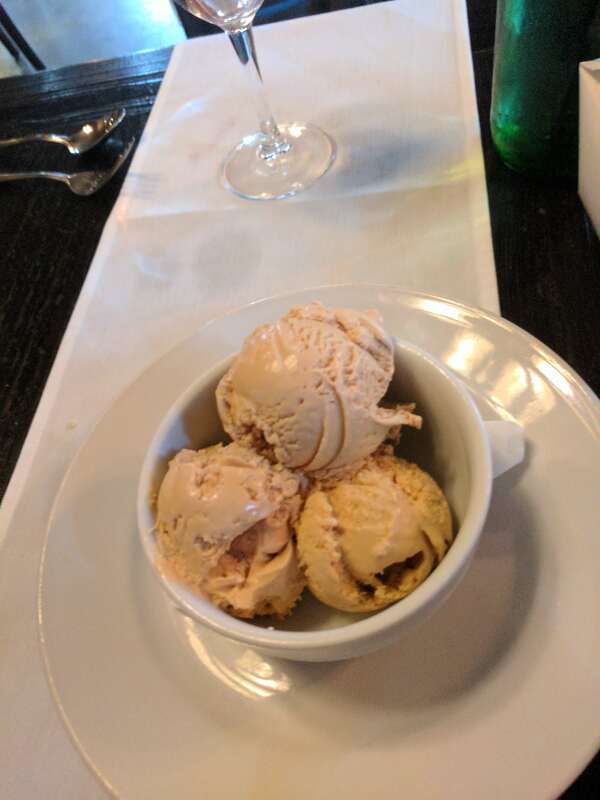 The bread pudding had a hint of peach in the sauce and a heavy hand with the all spice. 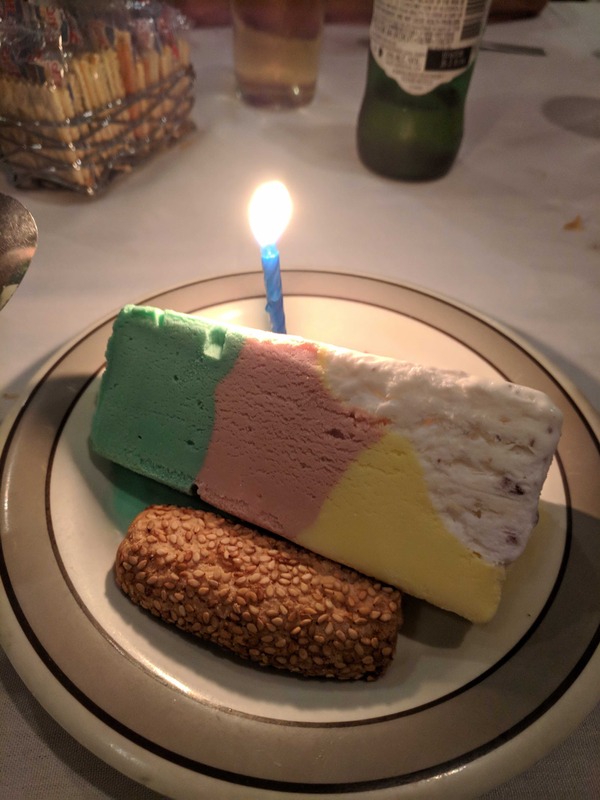 We all expected a little more tang from the creole cream cheese but the cheesecake was still pretty good on its own. The ice cream Z pie with the oreo crust was my favorite, though. I mean, how can you go wrong with a dessert that has both caramel and chocolate sauces on it? The wait staff is old school and most of them have been there for a decade or longer and know the menu backwards and forwards. 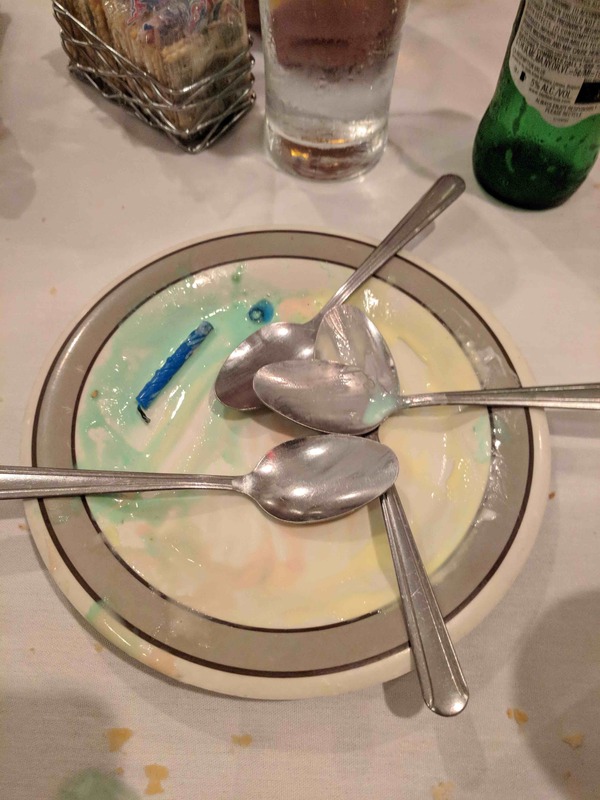 They are quick with refills and know when to swing by to check in and when to let the conversation go on with interrupting to remove empty plates. This is not a high end steak house (although the prices show how proud they are of their food) but a friendly place where the owner swings by to chat and to even lead the singing of happy birthday to patrons. 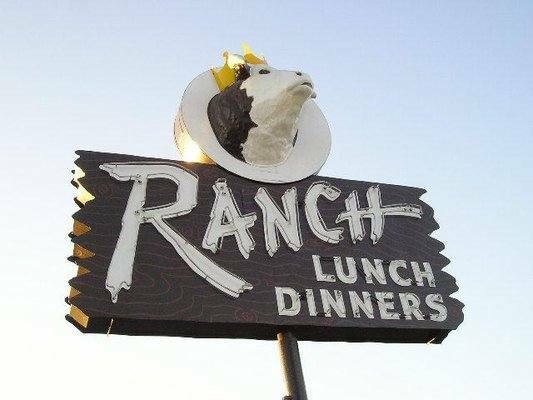 I enjoyed my meal and would recommend it for the meat lovers out there. Thanks so much for the lovely meal, Thomas and Charlotte. I just love celebrating my birthday with y’all! The conference participants went out to dinner tonight at Max Lager’s Wood Fired Grill and Brewery on Peachtree Street. It is in a cool old building and within walking distance of the hotel. 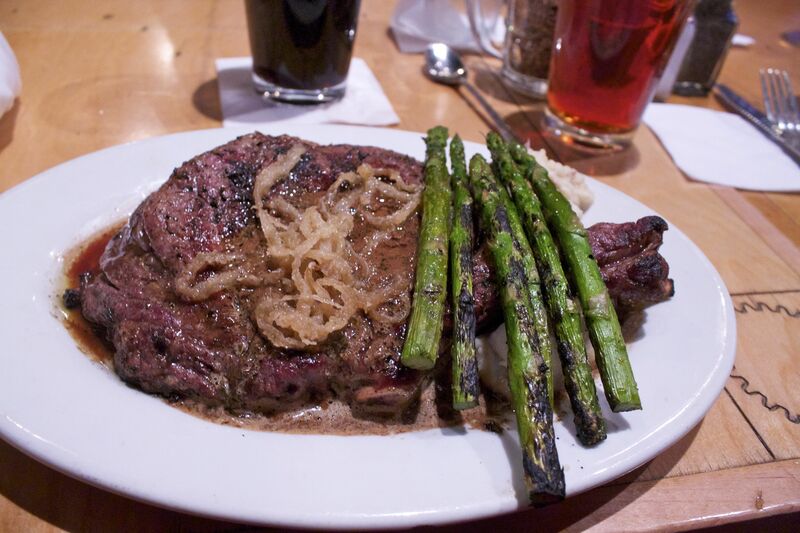 I was looking for meat, so I went for the Cowboy steak – a bone-in ribeye, grilled with Max Beer, balsamic butter, whipped potatoes, grilled asparagus. Beautifully marbled and nicely seasoned, it was a little more medium than the medium rare I wanted but still, it was a terrific steak. 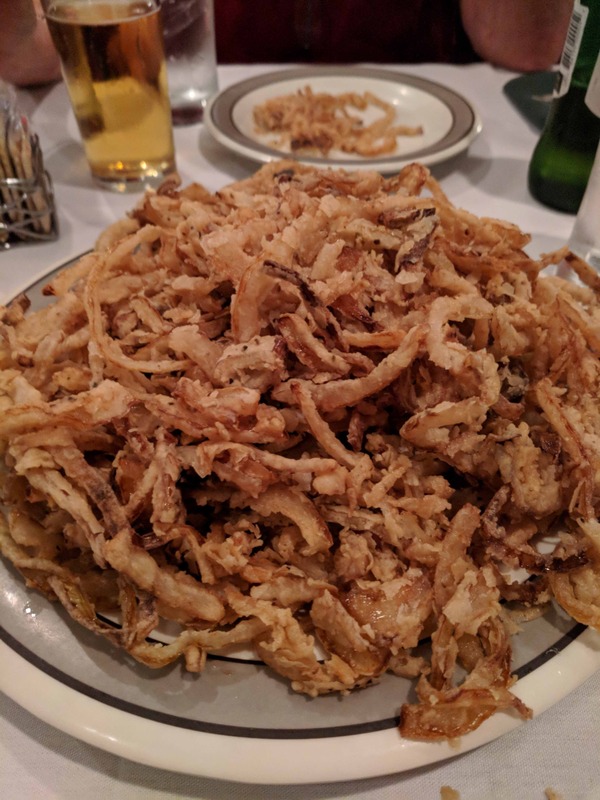 The service was a little uneven as there were three servers dealing with our large party and we’d be asked several times for the same thing but they got all the orders right and delivered correctly. OMG! Seriously, oh my God! 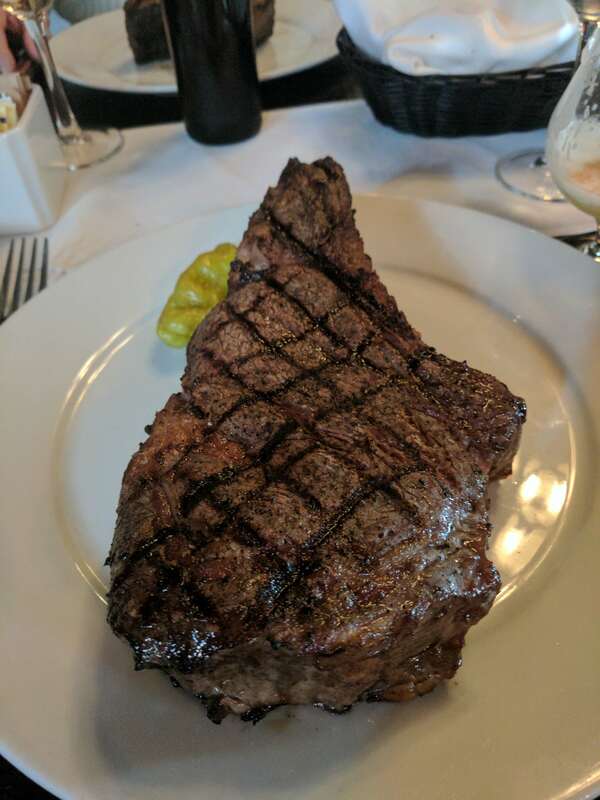 The steaks at Mr. John’s Steakhouse are absolutely incredible. 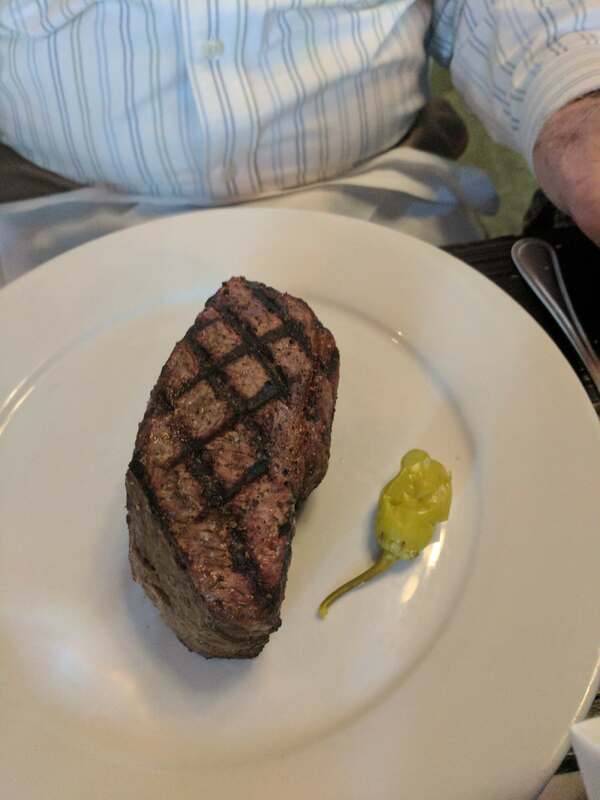 We all got ribeyes and they were cooked to perfections–I got mine medium rare, Dad rare and Mom blue and you could totally see the difference. 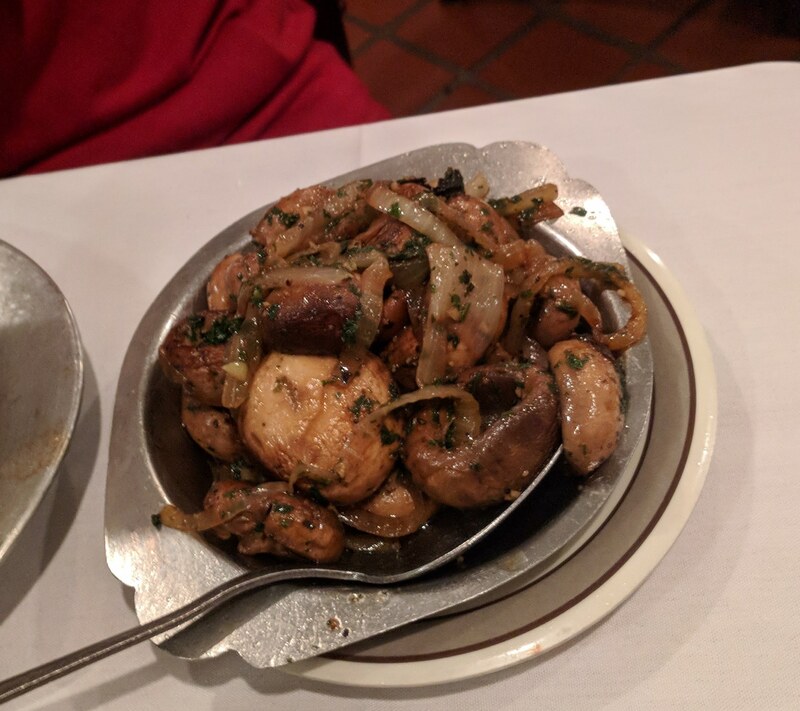 Flavored with just a touch of salt and pepper, the meat stood on its own in a sizzling, lightly buttered plate. Exquisite! 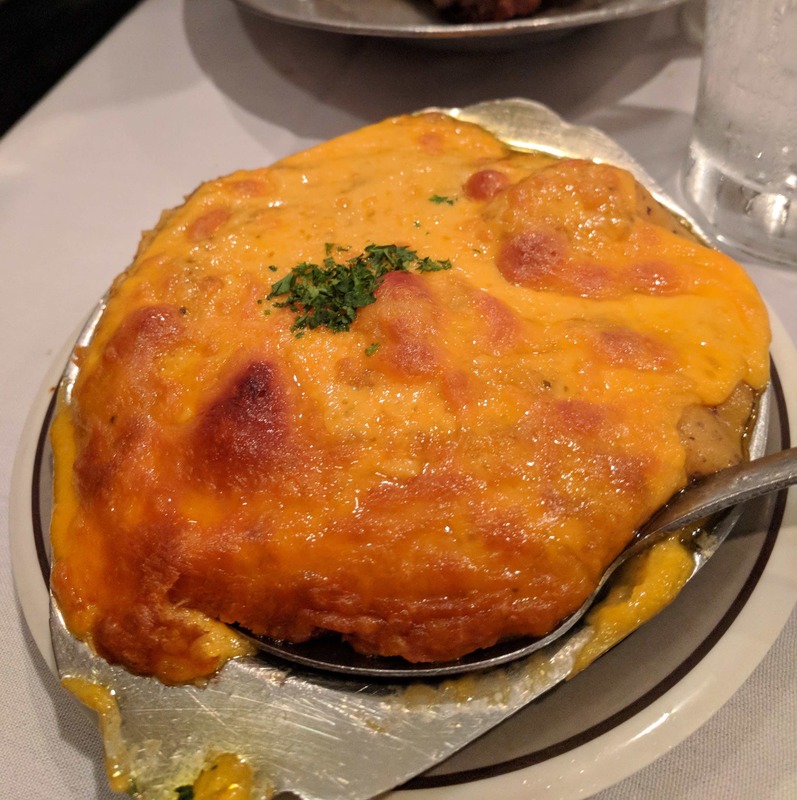 The potato sides (twice baked and au gratin) were delicious. Very creamy, with a broiled bit of cheese on top. 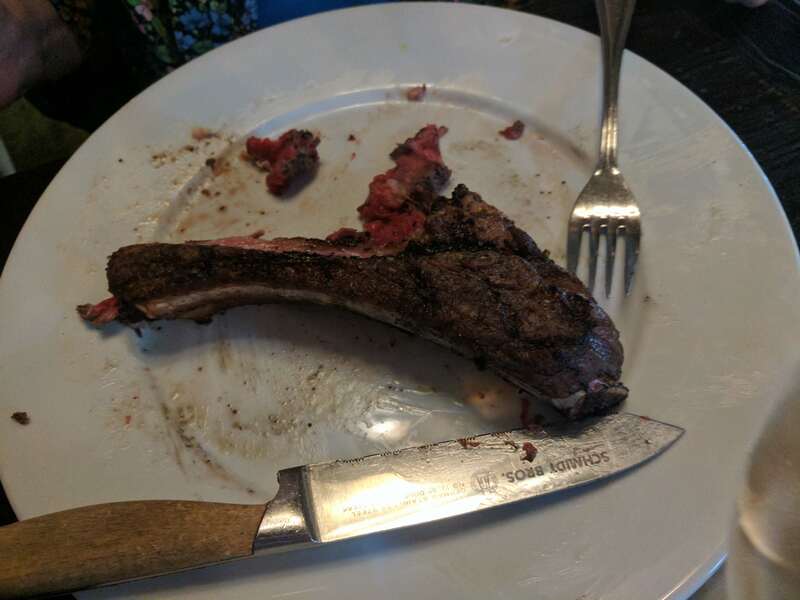 The Cabernet that I got with the meal matched perfectly the fine cut of meat. 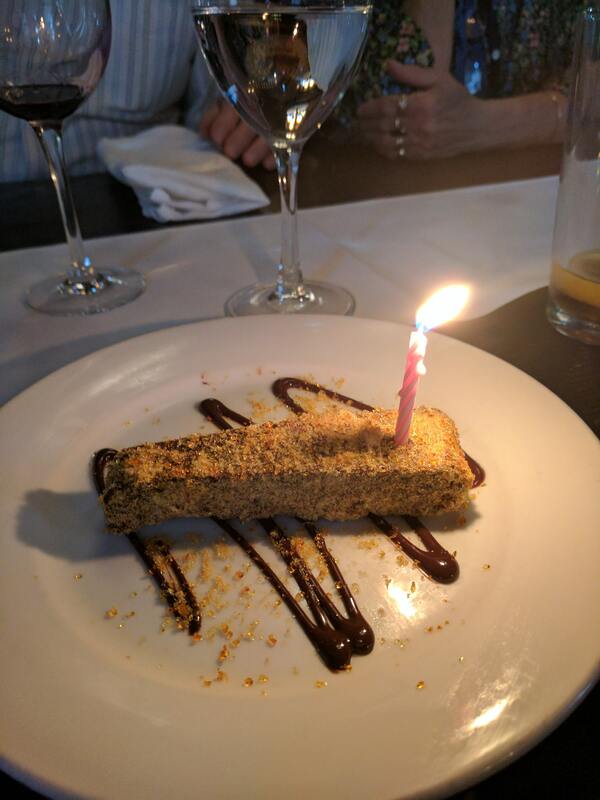 As it was my birthday (ratted out by my Dad), they gave a complimentary bread pudding. I’m not a fan of raisins in mine but the pudding was very good and the rum sauce nice and hard. Very much a place to take my next celebratory meal.